Do you want a giant, in-depth preview of how the new Battle.net will work? Check out the preview that just went up on the StarCraft II site - because it doesn't seem like it's that far off, now. Is Blizzard ramping up for the StarCraft II beta? Well, maybe, but those folks in Irvine are certainly ramping up for something, if the latest update to the SC2 site is any indication. 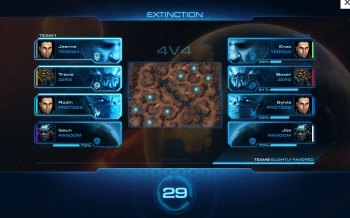 Blizzard has put up a giant comprehensive preview of the new Battle.net 2.0 (also known as the reason SC2 was delayed), indicating that the new service would be coming soon: "Battle.net is about to undergo the greatest update in its long and storied history as one of the world's most successful online gaming services." It isn't anything we haven't really seen before - social networking, the RealID that lets you have more in-depth communication with your real-life friends and family, and the Achievements system, among others - but it's nice to see it all laid out flat. It certainly looks more stylish than, say, Valve's Steam service (though one could argue that Steam is functionality over form). The interesting bit there (for me) is the little tidbit about how the Leagues and Ladders system will work: After a few games of StarCraft II, Battle.net will analyze your performance and slot you into a league of players with comparable skill - so rather than playing against all of B.net or just a few friends, you'll have a little local neighborhood of ~100 people who are all around your level. It's an interesting idea and one that might be tricky to pull off, but it's actually really appealing for me as a guy who likes RTSes, but who's never been all that great at them. It's a very interesting preview, and it might assure people that yes, Blizzard has been working on stuff and not just lounging around bathing themselves in the profits from WoW. As for what it means? Well, nobody get too excited - we'll only be setting ourselves up for a letdown - but it does seem like the pieces are falling into place.